Enjoy a relaxed Mornington Peninsula escape in this unique, superbly renovated stable conversion. 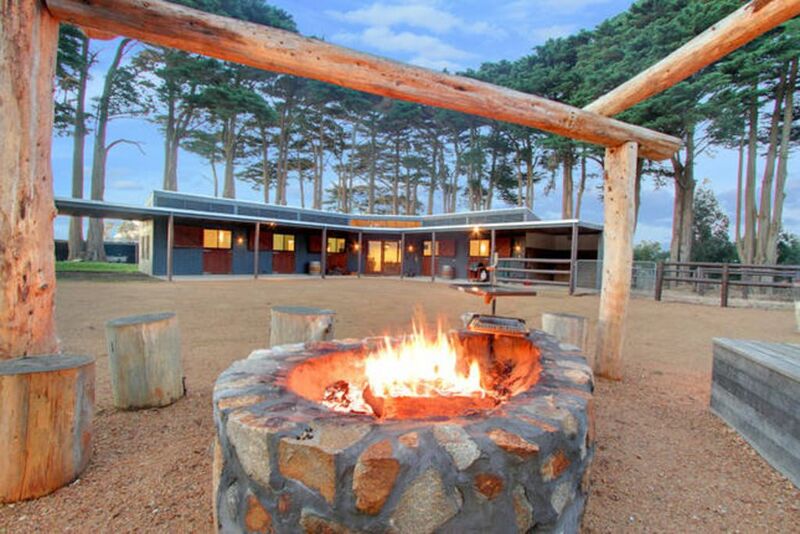 You will be blown away by this impressive stable accommodation situated under a canopy of 100 year old cypress pines. Set on 10 acres with magical views, Merricks Stables is sure to impress. Located in Merricks North, your accommodation is only minutes away from award winning wineries, restaurants, local markets and beaches. Also in close proximity is the Balnarring racecourse, shops and antiques, day spas and golf courses. This fully self-contained 3 bedroom stable conversion has a rustic feel with modern facilities, including a hand crafted kitchen and cosy wood fired Coonara with plenty of firewood supplied. Outside there is BBQ facilities, plenty of parking and an amazing fire pit area to relax during the evening hours, enjoy a glass of local wine and gaze at the stars. This private holiday retreat is sure to impress. Well appointed, very well maintained accommodation in a gorgeous setting. If you have an event in the region you can't go passed Merricks Stables. We'll be back! Fabulous place to relax and entertain. Clean, well appointed. Delightful owners who take pride in their accommodation. Love the beautiful peacock and the amazing surrounding rustic trees. Easy drive and close to Merricks, Balnarring. Highly recommend it. Picturesque property in a good location within a short drive to many wineries & the Redhill market. There is a paddock available if you wish to take your horse, and a fenced off pen for your dog. The fire pit is amazing with ample wood supplied. Great for couples and families. Clean & tidy. The kitchen is small with no oven but with plenty of restaurants close by, who wants to cook! Absolutely perfect, great location, loved it. Stayed with a small group of close friends. Everything was set up, even the fire was ready to go. The place was clean & welcoming. The bed was so comfy. I’d highly recommend Merricks Stable Accommodation to everyone. This place is a gem! We were impressed when we arrived and grew more & more fond of it throughout our stay. It’s modern with everything you need while retaining a sense of coziness and charm. Loved the fireplace, space for kids to run around, the nice big communal table and also was great that our dog was welcome! Highly recommended and we will stay again! Refurbished stables were the bomb! 1 couple & 3 singles recently stayed st Merricks stables! Fantastic location, everything we needed and more.